The easy way to master French grammar French Grammar For Dummies is a logical extension and complement to the successful language learning book, French For Dummies. In plain English, it teaches you the grammatical rules of the French language, including parts of speech, sentence construction, pronouns, adjectives, punctuation, stress and verb tenses, and moods. Throughout the book, you get plenty of practice opportunities to help you on your goal of mastering basic French grammar and usage. Grasp the grammatical rules of French including parts of speech, sentence construction, and verb tenses Enhance your descriptive speech with adverbs, adjectives, and prepositions Benefit from plenty of practice opportunities throughout the book Use the French language confidently and correctly Whether you′re a student studying French or a professional looking to get ahead of the pack by learning a second language, French Grammar For Dummies is your hands–on guide to quickly and painlessly master the written aspect of this popular language. 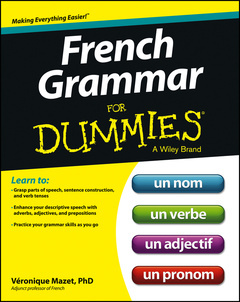 French Grammar For Dummies can aid students in high school and college, as well as adults looking to expand their knowledge of a widely used language. According to a survey by the Modern Language Association, overall enrollments in post–secondary language education jumped 17.9%, while general undergraduate enrollments increased only 7.5%. French is the official language of 28 countries, the only language other than English spoken on five continents, and one of the official working languages of the U.N., NATO, the International Red Cross, and more. Véronique Mazet has a doctorate in French from the University of Texas at Austin and is the author of two successful grammar books. She currently teaches French at Austin Community College in Austin, Texas.